Hydronephrosis is a seven chapter text that brings together the technical and scientific advances that have improved the treatment of hydronephrosis. Hydronephrosis is the dilatation of the renal pelvis and calyces due to functional or mechanical disorder of the upper end of the ureter or the pelvis of the kidney. 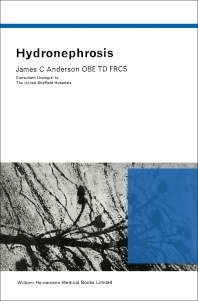 The introductory chapter provides an overview of the historical developments in the diagnosis and treatment options of hydronephrosis. The succeeding chapters discuss the disease's clinical manifestations, structural and functional aspects, symptoms, diagnosis, and operative procedures. The concluding chapters present various case histories on the results of surgical treatments of hydronephrotic patients. This book will be of value to urologists and kidney surgeons.